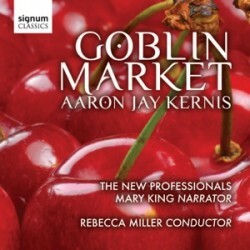 World premiere recordings of 2 works by Pulitzer Prize winning composer Aaron Jay Kernis. Goblin Market: a 45-minute dramatic work for narrator an ensemble, based on the poem of the same name by Victorian poet Christina Rosetti. Narration by Mary King. Invisible Mosaic: an early work by Kernis for large ensemble inspired by late Roman mosaics of the churches of Ravenna.